When Annie Lennox, legendary Scottish singer from the Eurythmics, recently declared that Beyoncé is not feminist with the statement “Listen, twerking is not feminism,” she firmly established herself as a representative for White feminism. In the face of calls for a more intersectional feminism, there are even White feminists who claim the whole concept of intersectionality is just academic jargon that doesn’t connect with the real world. Simply put, it’s not those who are calling for a feminism that is responsive to the specific issues they face that are being divisive. It’s those of us who refuse to acknowledge the need for an intersectional ethic in feminism. To better understand the concept of intersectionality, let’s look at one of the most cited pieces of evidence for the oppression of women: violence targeting women and girls. Using conservative estimates, between 25% and 50% of women experience gender-based violence (sexual violence, intimate partner violence, street harassment, or stalking) in their lifetime. But to cite that number without disaggregating the data hides the ways that multiple oppressions compound this violence. For instance, women (and men) of color are more likely to experience these forms of violence than White women or men and that wealth privilege can help to insulate some women from some forms of violence. We also find that bisexual women are far more likely to experience sexual violence than other women. And of those murdered in LGBTQ-based hate incidents, 78% were people of color, and Transgender people are 27% more likely to experience hate violence than cisgender people. In short, all women are at risk for gendered violence in the United States, but some women are far more at risk. And if we just talk generally about violence against women (or other issues like the wage gap), we fail to address the actual issues at stake, and as a result, we cannot envision solutions that dismantle the intersectional oppressions at play. At a more personal level, though, feminism without intersectionality keeps us from fully expressing who we are! A lack of intersectionality leads to an erasure of people and their identities. In preparing for writing this article, both of us, as the authors, recognized ways that heteronormative expectations restrict us from living outside of a binary of attraction and love. We’ve both found that if we are not actively dating people who share our gender, we are expected to live and act as if we are straight even though that may not be how we fully identify. Even in feminist and anti-oppressive spaces, strict gender roles define so many aspects of relationship that parts of our own identities are erased. Intersectionality is not only about confronting more obvious problems like violence and economic inequality. It’s also about allowing people to live more fully in their being and to have a voice in our movements! 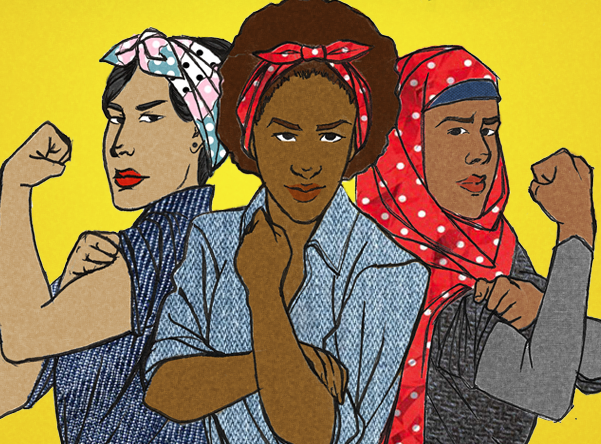 One misconception about intersectionality is that it encourages division and exclusion in the feminist movement. By including race, class, sexuality, and other identity markers in feminist analysis, some say, intersectional feminists are spreading the movement thin and undermining its unity. The trouble with this line of thinking is that a one-size-fits-all feminist movement that focuses only on the common ground between women is erasing rather than inclusive. Even if all women deal with sexism, not all women deal with racialized sexism, or transmisogyny, or cissexism. Glossing over the issues faced by specific groups of women for the sake of unity centers the feminist movement on those who have the most privilege and visibility. It allows those who already take up a disproportionate amount of space in the movement to look as if they’re making room for others without giving up any themselves. One-size-fits-all feminism is to intersectional feminism what #AllLivesMatter is to #BlackLivesMatter. The former’s attempt at inclusiveness can actually erase the latter’s acknowledgment of a unique issue that disproportionately affects a specific group of people. Intersectionality must be about more than intellectualizing the work. It must be grounded in an ethic of feminist praxis that blends critical theory, like that of Kimberlé Crenshaw, with self-work and activism. The following suggestions, then, offer ways that we can all incorporate an intersectional ethic into our daily practice of feminism. Intersectionality demands that we deliberately look within ourselves — at the places where we don’t understand and where we feel challenged. We must take upon ourselves the desire to learn about issues and identities that do not impact us personally. Thus, taking up the difficult work of investigating our own privilege is key to intersectional feminism. We have to move beyond a theoretical understanding of feminism and actually consider how we treat people in our daily lives. In Jamie’s work, for example,he has recognized a need to incorporate a more intersectional ethic that explicitly opposes anti-Semitism into his own Pro-Palestinian activism and language as well as the need to continually strive to undo the sexist socialization that keeps him from acting accountably to cis women and trans people. If we don’t do the work of understanding ourselves and our own shortcomings, our feminism will surely not be intersectional and accountable. 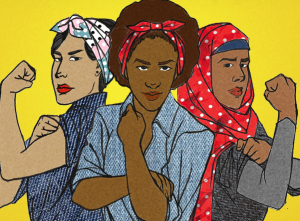 As feminists, it’s important that we pay attention to the fact that feminism is about more than ending sexism — it’s also about ending all the interconnected systems of oppression that affect different women in different ways. As someone who is middle class, for instance, it’s easy for Jarune to fail to understand issues of poverty in the Black community despite being otherwise knowledgeable about issues of race. Similarly, able bodied people don’t easily notice ableism, White people don’t easily notice racism, and cis people don’t easily notice transphobia. The things our privileges allow us to take for granted are the reasons we need intersectional analysis to do truly inclusive feminist work. Without it, it’s easy to center feminism around either our own experiences or the experiences of those who are already the most privileged in society. So make an effort to avoid centering feminism around yourself or people of privilege. Because society is more likely to listen to a White woman talk about racism than a person of color, for example, White feminists need to be mindful that they’re not talking over or for people of color. No matter what work you do or what your privileges are, take care to step back when things aren’t about you, educate yourself on things that don’t affect you, and pay attention when people speak to their experiences. There’s no room for perfectionism in feminism. That is to say that we must be willing to make and learn from mistakes in the process of doing feminist work. Adopting an intersectional framework is not an easy process. It involves seeking to understand things that are difficult for you to understand, empathizing with people who are not like you, stepping back instead of speaking over others, and opening yourself up to a high level of accountability. But it’s better to do all of that and fail than it is to avoid making an effort entirely. When people don’t make an effort to be intersectional, they’re quick to dismiss other people’s lived experiences in favor of their own beliefs, get defensive when called out, and complain that others are too politically correct or sensitive. It’s less constructive to avoid mistakes and bristle at criticism than it is to be open to learning, growing, and self-correcting as part of a continuous process. So when you inevitably mess up or are called out for something, how you respond matters. When people call each other out in social justice work, it can be an act of love. It’s about holding people accountable and making sure that the work they do is actually of value to those it’s meant to serve. Rather than take it personally or become defensive, recognize that being called out is not really about you or your worth as a person. You can be a perfectly nice person with good intentions and still do something that upholds oppressive structures, so focus on adjusting your behavior rather than saving face or exempting yourself from systemic oppression. Intersectional feminism is difficult. If you’re doing it right, it should be challenging you, stretching you, and making you uncomfortable. But feminism isn’t here to make anyone comfortable. Quite to the contrary, intersectional feminism should be making everyone uncomfortable because we never grow or progress when we are comfortable. We grow when we are hurting or struggling or stretching ourselves to understand something new. The difficulty of intersectional feminism is a difficulty and discomfort that is meant to inspire change. Thus, we have to be willing to take up the critical thinking and self-work necessary to push back against our privileges and to create an intersectional ethic and lens through which our feminism is crafted. The journey toward intersectionality is difficult. You will make mistakes; we all will. But if we want to realize relationships, communities, or societies built upon justice, we have to keep doing that work. Jarune Uwujaren is a Contributing Writer for Everyday Feminism. They are a Nigerian-American student recent grad who’s stumbling towards a career in writing. Jarune can currently be found drifting around the DC metro area with a phone or a laptop nearby. When not writing for fun or profit, Jarune enjoys food, fresh air, good books, drawing, poetry, and sci-fi. Read their articles.